IT’S THE 10TH TEMWA ART FOR AFRICA AUCTION – AND YOU’RE INVITED! This year, Temwa will be hosting a very special ART FOR AFRICA AUCTION – the 10th auction since the first was held at the Tobacco Factory in 2003. This years anniversary event will celebrate the huge and positive impact the artistic community has had on the people living in northern Malawi. Over the last ten years Temwa has grown and developed alongside the urban art scene, artists have become established on a world wide scale, and Temwa’s projects have expanded to help tens of thousands of people to dramatically change their lives. To date, £85,000 has been raised through Temwa’s art events. This years event kicks off with with live painting from some of the urban art scenes finest talents, including Mr Jago, China Mike, Mau Mau and more to be confirmed. PLUS Babyhead frontman Tom as the entertaining auctioneer. And as if that isn’t enough, there are some legendary DJs and beatboxers lined up to carry the party on into the wee hours. Viewing begins at 6pm, auction starting at 8pm. 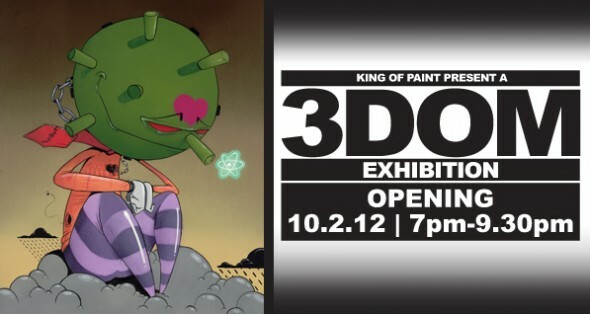 Friday night saw the opening of Dicy’s solo show at the King of Paint. Unfortunately we couldn’t make it on the Friday, but it would seem that it was a good and busy night. We did drop by to take in the show on Saturday and it would seem that Dicy has really pushed himself for this one. The collection of new work is stunning and it was good to see some dots scattered around the gallery. The show is on in conjnction with launch of a signed and numbered, limited edition publication by Dicy called ‘Wall to Wall’, a celebration of Dicy’s works on cnavas from 1998 to 2011. 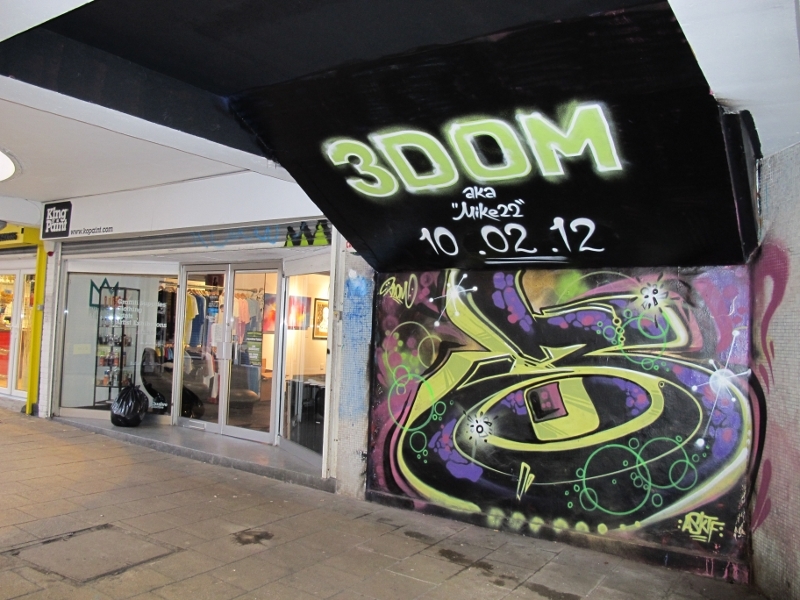 “3DOM A.K.A MIKE22” – Solo show by 3Dom @ King of Paint, Bristol on Friday stick you’re head through the door and take a look into the mind of 3Dom. “3Dom began studying illustration at the Bower Ashton campus of U.W.E. and in his spare time began his love affair with graffiti. 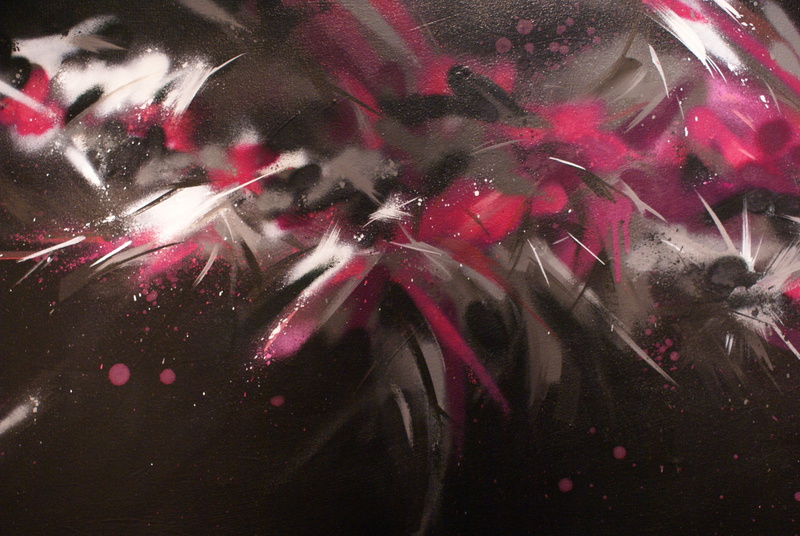 After honing his skills with a can on the streets of Bristol, 3Dom is here at the King Of Paint gallery with a solo show entitled “ 3Dom a.k.a. Mike 22 “. 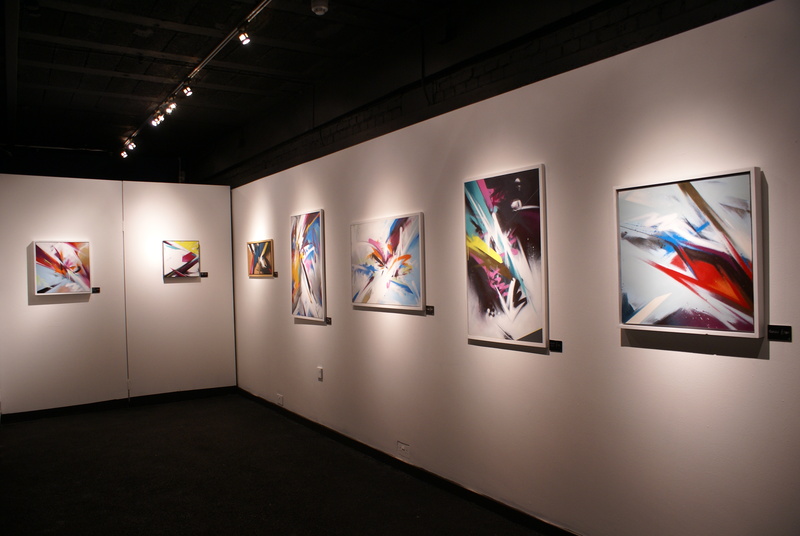 This show is a comprehensive study of Mikes’ last ten years in the graff world, his journey and a look at all the world through his eyes. A visual spectacle and a feast to behold. His work could be described as a childs cartoon, mixed with semiology, surrealism and social conscience, something for children to enjoy and adults to dissect”. 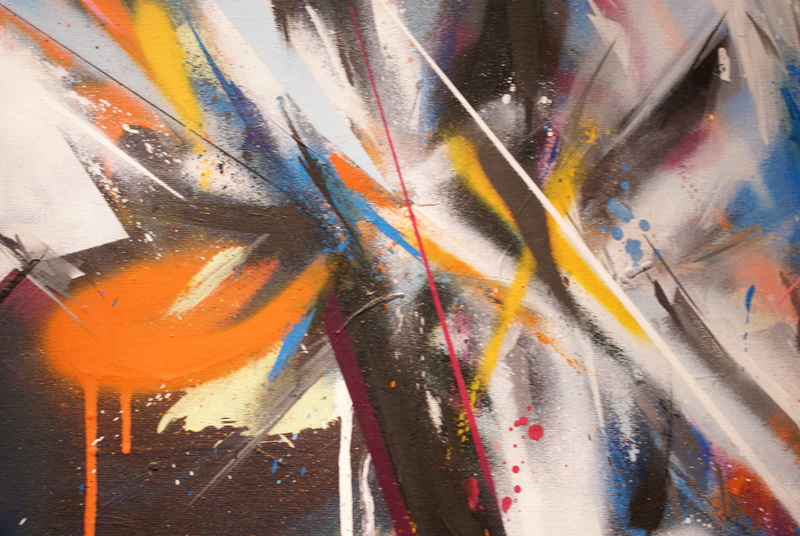 We dropped by the King Of Paint last night to take in the new solo show from Paris – ‘Come and Join the Future’. The new collection of work sees Paris taking a brightly coloured journey into abstractism, it is colourful, fun and, judging by the red dots going up .. popular. The show opens to the public at 7.30pm this evening so …. Go and join the Future we think you’ll like it! And of course The Deaner Show opens at the Upfest Gallery in Bedminster tonight, plenty of time to fit both shows in though. Also as part of The Deaner Show there will be live painting taking place in the Vector Car Park on Raleigh Road (off North Street, opposite The Tobacco Factory) over the weekend. 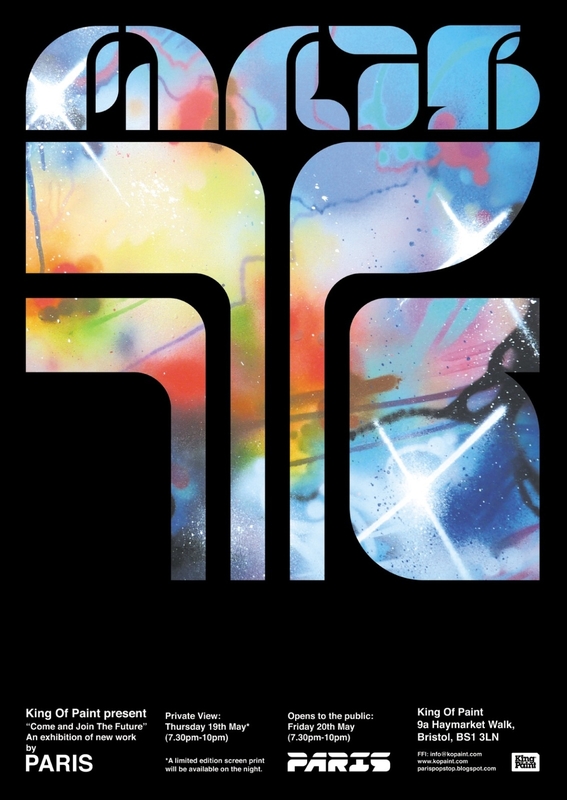 For over 20 years Graham Dews has built up an extensive and diverse body of work under the graffiti pseudonym PARIS, producing hand crafted letter forms, graffiti art and graphics for the design, music, film and fashion industries. Joined by the other members of TCF (Twentieth Century Frescoes Crew, the seminal UK aerosol art team), he went on to paint hundreds of graffiti masterpieces and burners throughout the UK as well as collaborate with artists from around the world, including France, Switzerland, Spain and Germany. 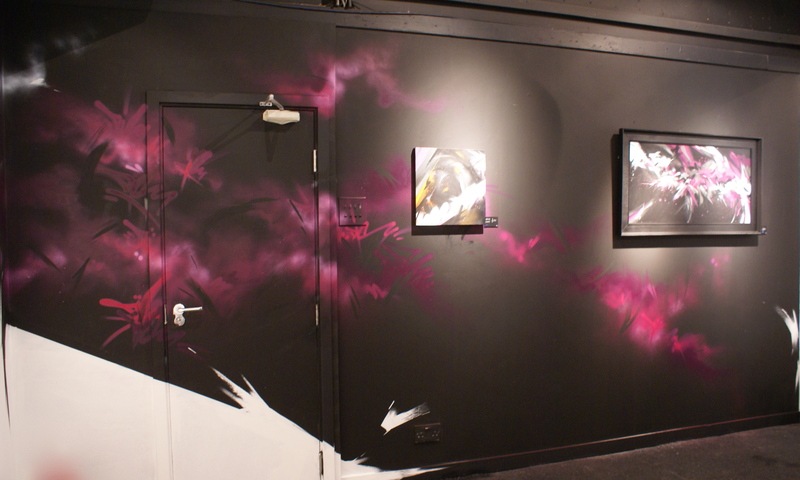 As with his graffiti, Graham is continually pushing his art work in new directions. His digital work ranges from stylised logos and fonts, to dynamic patterns and limited edition prints and posters as well as canvas, printed fabrics and the ultimate surface of the city streets. Friday the 20th May brings Paris to the King Of Paint shop and gallery space in Bristol where he will be showing his newest creations to the public in his solo show ‘Come and Join the Future’.